Using Flat Rate Pricing Systems Builds Trust With Your Customers. How Do You Build Trust With Your Customers? It Is Done By Using Flat Rate Pricing! Why does the use of a flat rate pricing systems improve customer satisfaction? It is a situation where your dealership assume some or all of the risk in a business transaction. I believe the customer is at risk in this situation. 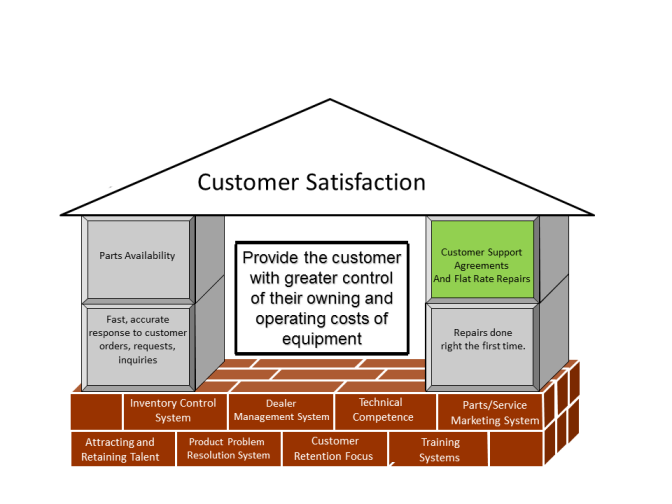 The central theme of this website is to help your customers to gain control of their owning and operation costs. Flat rates allow you to give customers a firm number up front without uncertainties. One of the critical things is that we get away from the dollar per hour charge and adopt a single component charge. I have sat in meetings with customers to dispute invoices they have received on a repair where we used an hourly charge was used versus a flat rate charge. In most cases my customer challenged how much labor or Parts were used in the repair. These meetings took hours to research because I wanted to provide good answers for my customer. If the Service Reports were not complete (not well written) I found myself reducing the charges for both the labor and Parts used in the repair. This happened approximately 30% of the time. The final results was an unhappy customer and a reduction of sales and profit in the repair. So what led us to change our pricing system? We wanted to follow the theme we had established of finding ways for our customers to have greater control over their owning and operating costs and be retained as customers over a longer period of time. We started by examining the “common repairs” to components. What components did we examine first? Within one year we had added 185 components we could rebuild and to which we could offer a one single price. This represented approximately 70% of the repairs we performed. We held several training sessions for our Service Supervisors(both shop and field) and our service technicians on how to determine when a flat rate price component is offered in a repair. We trained technicians in great detail on how to inspect a component and how the component was to be repaired. Most importantly, we trained technicians in the total number of hours to be used in the repair or rebuild. We provided “special tooling” for technicians to complete the repair in a timely basis with high quality as the key driver. Finally, we provided a financial incentives to our technicians who could produce a high quality repair under the guidelines provided. • Sales and gross in both Parts and Service departments grew by 15% to 25%. Flat Rate pricing systems will improve your relationship with your customers and grow your Parts and Service gross profit. Flat Rate pricing systems will improve your relationship with your customers. Click here to learn more.